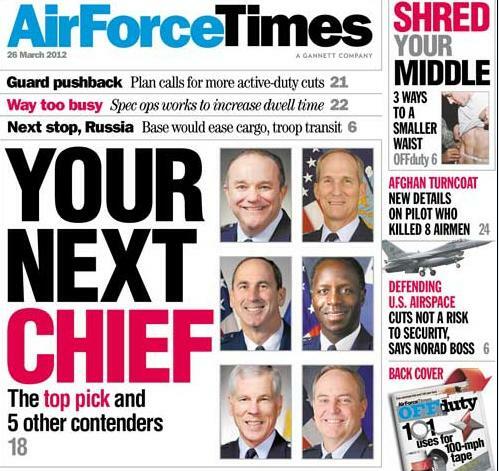 This week’s Air Force Times lists the six contenders to become next Air Force chief of staff. Want to know who the top contender is? Here’s a clue: In a rousing speech at the academy in November, he told cadets that they had better get ready to lead airmen when the graduate. “If you let them down, I will track you down and I will hurt you, and that’s going to be embarrassing considering how old I am,” he warned cadets. In other news, the United States is looking into whether there is a link between a shooting last April in Kabul, in which an Afghan officer killed eight airmen, and allegations of corruption in the Afghan air force. Days after the shooting, a U.S. lieutenant colonel told investigators that Afghans had been using their aircraft since the 1990s to make money on the side and they, “want to continue these nefarious and profitable activities with the billions of dollars worth of aircraft we’re buying them,” according to an investigation into the shooting that was made public in January. Two of the airmen killed had suggested cutting fuel to the nascent Afghan air corps so pilots could only make scheduled flights, the report said. The Wall Street Journal was first to report that investigators were looking at whether the corruption and shooting were linked. And state governors are calling for more cuts from the active-duty Air Force instead of Guard and Reserve. The Council of Governors has proposed an alternative plan to the personnel cuts called for in the Air Force’s proposed fiscal 2013 budget that would trim active-duty ranks by 6,400 instead of 3,900 airmen. The lawmakers object to the current Air Force plan, which calls for cutting 5,100 guardsmen and 900 reservists.